The Central United States Earthquake Consortium (CUSEC) was formed in 1983, and has received funding support from the U.S. Department of Homeland Security (DHS) and FEMA. The New Madrid Fault is a regional threat with national implications. CUSEC Member States are those most vulnerable to the effects of earthquakes in the region: Alabama, Arkansas, Illinois, Indiana, Kentucky, Mississippi, Missouri, and Tennessee. Its CAPSTONE-14 initiative was a three-year, multi-state scope of planning and preparedness activities culminating in a major, multi-state earthquake Exercise in June, 2014. In its after-action report, in a section on Communications, CUSEC recognized that a major earthquake situation could cut off conventional means of communication, and has emphasized the need for effective alternative communication technologies and capabilities for use when normal ones go down. Partners must be able to communicate with emergency operations centers and field locations for security, situational awareness and operational progress. The report cited satellite communications as an alternate service, but noted they were costly to acquire and sometimes difficult and challenging to operate. "Other means of alternate communications include the National Warning System (NAWAS), and Amateur Radio (ham radio) operations," the report said, and referred to FEMA Administrator Craig Fugate's July comments on the resiliency and value of Amateur Radio. A "critical task" of the CAPSTONE-14 initiative was identified: "Utilize Amateur Radio assets to establish communications with local, state, federal and private sector partners." One of the report recommendations was to "establish standards for various electronic resource request forms that meet the file size limitations of email and amateur band radio capabilities." The report noted that during CAPSTONE-14, states "initiated interstate communications utilizing Radio Amateur Civil Emergency Services (RACES) and successfully communicated via voice (audible communications), chat (text communications) and RMS Express/Winlink radio email system (email communications)." And "Winlink communications ultimately proved as a successful means to share . . . request forms," even though initial attempts were unsuccessful, due to file size. Operators implemented file size and compatibility/standardization fixes and initial problems were solved. The report concluded that "Regularly scheduled training and functional exercises conducted by RACES and MARS operators will improve speed and understanding during real world emergency operations." Click here for the complete report. [The New Madrid Seismic Zone (NMSZ) is responsible for three of the largest earthquakes in U.S. history, during 1811-12. These quakes were felt strongly over 50,000 square miles and moderately across 1 million square miles, according to the U.S. Geological Survey (USGS). The affected area was therefore more than twice that of the 1964 Great Alaskan Earthquake, the largest earthquake in U.S. history, and approximately 10 times that of the 1906 San Francisco Earthquake. Although it has been more than two centuries since the last major earthquake along the NMSZ, the threat of a catastrophic earthquake in the region has not waned. Due to population density and current infrastructure, a similar earthquake today would be devastating.- excerpted from the report]. "Public safety is a cooperative effort that requires planning, training, and thoughtful resource management on many levels. We collaborate with many partner agencies such as fire protection districts, rescue groups and BCARES [Boulder County ARES] to provide the best in public service for Boulder County. Many partner agencies rely on volunteers willing to devote their resources to training, and event deployment. BCARES is a volunteer organization of licensed amateur radio operators that we can call upon for assistance. For more information on this volunteer organization visit: www.bouldercountyares.org." "Scott Whitehead [KA0QPT] of the Boulder County Sheriff's Office received a Public Service Communication Commendation from the American Radio Relay League in recognition of his meritorious service in providing aid to an injured hiker July 21, 2014. The award was presented today by Jack Ciaccia, PIO for BCARES, the local ARRL organization. Scott heard an incoming dispatch call from a Colorado Springs area Ham operator relaying information on an injured party in a remote location. Scott has been a Ham operator since 1983. He used his knowledge of area radio repeaters to make radio contact with the Ham operator with the injured party, and guided rescue workers to their location. Great job Scott!" The ARRL released a news article recently concerning the hacking of a server in the League's network late last month. That article can be found here. My professional background is in digital forensic investigations and includes teaching in the Digital Forensics and Cyber Security program at Valencia College in Orlando (Florida) so I'd like to make some cyber security suggestions to readers. need to change the passwords on those sites as well. Hackers will use passwords from one compromised website to attempt to access the person's accounts on other websites. Ideally each website that you access should have a unique password; likewise, each email account you have should have a unique password. things as the names of relatives and pets. The best passwords are random strings rather than names and words and should be 8 characters or longer. Now the question that this immediately generates is how do I remember dozens or hundreds of random passwords? The answer is that you don't; you only need to memorize one that is a master password used by software that secures all of the information for all of your email/website accounts. There are many such programs available, both paid and free, that can securely protect your passwords on your home computer, your mobile devices such as smartphones and tablets, and on a flash drive so you can have them available wherever you are. Because everyone's needs are different, I won't advise using any particular solution. I will, however, give you an example of a free solution for PCs that has also been ported to most other platforms. The software is named "Password Safe" and is available at no cost from: http://passwordsafe.sourceforge.net/ (click on the "Download latest version" found on that page to access the program itself). this program, just an example of what is available. 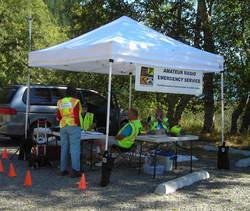 On the last Sunday of summer--another beautiful, cloudless day at the site high in the central Cascade Mountains of Washington state--two hams had just fired up their station to prepare for a second day of contest operation in the Washington State QSO Party, better known as the Salmon Run. About 0845, a motorcyclist rode into the remote camp. He told them that his friend had broken a leg in an accident just a short distance up the unpaved Forest Service road. He asked if the campers would please use their cell phones to call an ambulance. The hams explained that, unfortunately, they'd already checked and had no cellular service available at the site. They told him they did have ham radio communications, and would be able to get help through that service. The biker thanked them and rode back to his injured friend. The contest team -- Robert Grinnell, KD7WNV and Tim Kane, K7ANE -- are both residents of the Seattle area, and members of the Mike & Key ARC. After three years of contesting together on the western side of the state, this was their first contest "expedition" on the eastern side of the mountains, where they'd situated their station on a score-doubling county line. At the moment the rider approached them, Tim had selected a spot on 20 meters near the suggested contest frequency and was ensuring proper operation and tuning of the station. Robert was assembling a new tri-band yagi that they hoped to use later that day. They quickly considered how best to obtain help. While the HF station was already in operation and chances were good that they would be able to contact someone somewhere, they knew that 9-1-1 systems are localized, and a distant party might have difficulty reaching the right agency. A local contact in one of the two counties could just dial 9-1-1 directly. They had VHF/UHF rigs in their trucks, but being from out of the area, did not have any local repeaters programmed. Robert had a few-years-old copy of the ARRL Repeater Directory along, but some listings would be archaic. That limitation, compounded with the time it would take to program each repeater, and the doubtful chances that someone would be using or monitoring a repeater at that time on a Sunday morning, did not bode well for quickly making a local contact. They decided that Tim would stay on HF, and Robert would try for a local contact. After a quick check of the 75 and 40 meter bands, both of which were fairly quiet, Tim found the SOARA (South Orange ARA, Mission Viejo, California) net operating on 7200 kHz. He considered using "Mayday" or "Pan" emergency calls, but decided that "Break Break Break with a Medical Emergency" would be more readily understood. After two calls, Louis Frank, KG6FCT, responded, and Tim had him move up 3 kHz, away from the net operation. Louis was at his home, east of Sacramento, California. Tim explained the situation, and Robert passed along detailed location information. They asked Louis to telephone the Washington State Patrol, or a sheriff for either of the two counties, and request that an ambulance be dispatched. With contact made and the process underway via HF, Robert ceased efforts at a local contact, and they decided he should drive up to the accident scene, about a quarter mile distant. They quickly chose a 2 meter simplex frequency on which to maintain communications between them, with Robert on his mobile rig and Tim with an HT at the campsite. Louis first tried his area 9-1-1 dispatcher, who said he couldn't transfer the call to the out-of-state jurisdictions. He then tried the 4-1-1 information operator, but only got administrative numbers that didn't answer on a Sunday morning, and just referred the caller to 9-1-1 for emergencies. Tim continued monitoring the HF frequency. Having not heard their earlier communications, a Washington state contest station began calling CQ just one kHz up from where they were standing by, and was bleeding over badly. Tm contacted him, explained the situation, and asked him to please move up band a bit. In the best ham tradition, the station immediately agreed and moved. Upon reaching the accident scene, Robert was informed that one of the bikers had managed to get one bar of signal on his cell phone, and had advised the victim's wife back in the Seattle area of the accident. She, too, was now working on getting medical help. Through his persistence, Louis finally obtained a number for the Kittitas County Sheriff's Office (KCSO), which was answered, and he relayed the situation and request. As fate would have it, the victim's wife was on another line with the dispatch center, having just gotten through as well. The KCSO dispatcher asked Louis for additional information about the accident, the victim, and whether the ambulance would need to be four-wheel-drive to reach the accident scene. Louis relayed the queries to Tim, who in turn asked Robert at the accident scene. They then passed the responses back to the dispatcher, and told them that 4WD was not needed. The victim was in pain but his condition otherwise did not seem serious. Once KCSO advised that the ambulance was en route, Louis, Tim and Robert maintained the frequencies, in case further action was required or information needed to be passed. Robert suggested to the motorcyclists that one of them ride down the dirt road to the highway, wait for the ambulance, and lead it to the accident scene, which they did. About thirty minutes later an aid car from the Kittitas Valley Fire and Rescue Department drove by the camp to the accident scene. It was followed by a USFS brush fire truck and a Sheriff's cruiser.Ten minutes later a second Kittitas aid car also arrived. At the accident scene the Emergency Medical Techs assessed the rider's injuries, stabilized his broken leg, and administered an IV. They transferred him to a gurney and into the ambulance. The emergency response vehicles then started their return to the hospital, some forty miles away. The motorcyclist who originally approached the hams came by the camp, and thanked them for their help. Amateur Radio operators on the Olympic Peninsula of Washington State encounter unique situations and terrain that we are expected to overcome in times of emergency. To prepare for such times the Clallam County ARES seeks opportunities to participate in community activities that allow us to deploy and communicate in support as practice and preparedness. We were given such an opportunity when a member of the North Olympic Running Club approached us about an inaugural trail marathon called the Great Olympic Adventure Trail Marathon (The GOAT), to be run the first week of September 2014. Our Training Coordinator, Kathleen Reiter, N1ERT was put in contact with the marathon organizer Lorrie Mittmann who provided an outline of the event, and her concerns about lack of cell phone coverage, and hence reliable safety and security communications. their approval, a plan for our participation was presented to the ARES members at the monthly training meeting. To expand knowledge of the area and as a dry run for the event, the Clallam County ARES participation in the Washington State Emergency Department's statewide Fifth Saturday Exercise on August 30 became a tactical field exercise for us. Since our ARES operates under the auspices of Clallam County Emergency Management we were assigned Mission Numbers for both the exercise and the event. Information concerning road conditions, hazards and communications status were to be provided to them in the After Action reports. The local scenario was a wild-land fire response near the town of Joyce, Washington. Deployment would involve some tricky driving on logging roads as well as overcoming the usual terrain obstructions. Although some reconnaissance of the area had been accomplished prior to the exercise, road and weather conditions had changed. The exercise began with members contacting the Resources Net for check-in. They proceeded to a Staging Area at the Crescent School in Joyce, where they received their instructions and safety briefing for deployment. The IC was the Emergency Coordinator, Bill Carter, W7WEC. Assignments and maps were issued to the two person teams and Operations took control of the exercise from Resources. The teams were then dispatched to their respective locations. Upon reporting their arrivals at their locations teams awaited net roll calls on repeater and simplex channels. When Operations found that they could not maintain contact with all of the deployed elements from the Incident Command Post, control was passed to the only station that could. The teams assessed road conditions, and reported locations and signal strengths to the net. All then returned to the Staging Area for the hot wash and were released to the Resources Net Control for final check-out. Our findings were reported to the marathon event coordinator and necessary changes were made in planning for the event. For the marathon, after contacting Resources, ARES personnel deployed directly to the locations they had manned during the exercise. David, KE7TTT and Valerie, KF7VAL Hannon opened the Operations Net to receive check-ins as members arrived on location. ARES members manned the Start locations, the Finish Line and all critical points along the trail where cell phone communications were impossible because of terrain. Aside from minor glitches, radio communications ran smoothly the entire day. 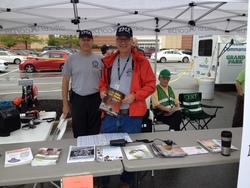 A Denver, Colorado, volunteer and radio amateur with the Citizen Emergency Response Team has received an Honorable Mention as part of FEMA's 2014 Community Preparedness winners. FEMA announced the winners as they recognized individuals who have taken action to help prepare their communities. David E. Cook, KC0MHT, a Denver CERT volunteer since 2008, continues to serve the Denver community as a trainer, facilitator and exercise coordinator. He has helped train more than 4000 people over the last several years and has been a volunteer in numerous emergency events and exercises, including the 2013 Colorado floods. David was nominated for, and was awarded an Honorable Mention as a "Community Preparedness Hero."